Please take a moment to look through our website! We include product information, specifications, MSDS and much more for each of our products. Most all of the information can be printed in PDF format directly from any web page. An easy to use Quote System is available to submit and receive a quote from us for your project or requirements regardless of size. Also visit our website www.northernfiltermedia.com! This was the first pool season useing the Zeobest Ultra. 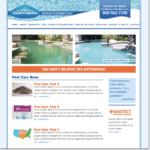 Our experience was the water changed to clear more quickly than past years, the pink algae that is a problem most years was never a problem this summer. We needed to backwash less frequent and it just made everything chemicalwise go much easier.